This is the first recorded moment in history in which one human being forgives another. According to the Midrash, God had forgiven before this, but not according to the plain sense of the text. Forgiveness is conspicuously lacking as an element in the stories of the Flood, the Tower of Babel, and Sodom and the cities of the plain. When Abraham prayed his audacious prayer for the people of Sodom, he did not ask God to forgive them. His argument was about justice not forgiveness. Perhaps there were innocent people there, fifty or even ten. It would be unjust for them to die. Their merit should therefore save the others, says Abraham. That is quite different from asking God to forgive. What they said was a white lie, but Joseph understood why they said it. The brothers used the word “forgive” – this is the first time it appears explicitly in the Torah – because they were still unsure about what Joseph meant. Does someone truly forgive those who sold him into slavery? Joseph wept that his brothers had not fully understood that he had forgiven them long before. He no longer felt ill-will toward them. He had no anger, no lingering resentment, no desire for revenge. He had conquered his emotions and reframed his understanding of events. Forgiveness does not appear in every culture. It is not a human universal, nor is it a biological imperative. We know this from a fascinating study by American classicist David Konstan, Before Forgiveness: the origins of a moral idea (2010). In it he argues that there was no concept of forgiveness in the literature of the ancient Greeks. There was something else, often mistaken for forgiveness. There is appeasement of anger. When someone does harm to someone else, the victim is angry and seeks revenge. This is clearly dangerous for the perpetrator and he or she may try to get the victim to calm down and move on. They may make excuses: It wasn’t me, it was someone else. Or, it was me but I couldn’t help it. Or, it was me but it was a small wrong, and I have done you much good in the past, so on balance you should let it pass. Alternatively, or in conjunction with these other strategies, the perpetrator may beg, plead, and perform some ritual of abasement or humiliation. This is a way of saying to the victim, “I am not really a threat.” The Greek word sugnome, sometimes translated as forgiveness, really means, says Konstan, exculpation or absolution. It is not that I forgive you for what you did, but that I understand why you did it – you could not really help it, you were caught up in circumstances beyond your control – or, alternatively, I do not need to take revenge because you have now shown by your deference to me that you hold me in proper respect. My dignity has been restored. There is a classic example of appeasement in the Torah: Jacob’s behaviour toward Esau when they meet again after a long separation. Jacob had fled home after Rebekah overheard Esau resolving to kill him after Isaac’s death (Gen. 27: 41). Prior to the meeting Jacob sends him a huge gift of cattle, saying “I will appease him with the present that goes before me, and afterward I will see his face; perhaps he will accept me.” (Gen. 32: 21). When the brothers meet, Jacob bows down to Esau seven times, a classic abasement ritual. The brothers meet, kiss, embrace, and go their separate ways, but not because Esau has forgiven Jacob but because either he has forgotten or he has been placated. Appeasement as a form of conflict management exists even among non-humans. Frans de Waal, the primatologist, has described peacemaking rituals among chimpanzees, bonobos and mountain gorillas. There are contests for dominance among the social animals, but there must also be ways of restoring harmony to the group if it is to survive at all. So there are forms of appeasement and peacemaking that are pre-moral and have existed since the birth of humanity. Forgiveness has not. 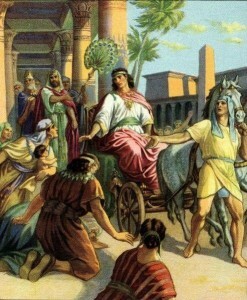 Konstan argues that its first appearance is in the Hebrew Bible and he cites the case of Joseph. What he does not make clear is why Joseph forgives, and why the idea and institution are born specifically within Judaism. The answer is that within Judaism a new form of morality was born. Judaism is (primarily) an ethic of guilt, as opposed to most other systems, which are ethics of shame. One of the fundamental differences between them is that shame attaches to the person. Guilt attaches to the act. In shame cultures when a person does wrong he or she is, as it were, stained, marked, defiled. In guilt cultures what is wrong is not the doer but the deed, not the sinner but the sin. The person retains his or her fundamental worth (“the soul you gave me is pure,” as we say in our prayers). It is the act that has somehow to be put right. That is why in guilt cultures there are processes of repentance, atonement, and forgiveness. That is the explanation for Joseph’s behaviour from the moment the brothers appear before him in Egypt for the first time to the point where, in this week’s parsha, he announces his identity and forgives his brothers. It is a textbook case of putting the brothers through a course in atonement, the first in literature. Joseph is thus teaching them, and the Torah is teaching us, what it is to earn forgiveness. This is the first stage of repentance. They admit they have done wrong. Next, after the second meeting, Joseph has his special silver cup planted in Benjamin’s sack. It is found and the brothers are brought back. They are told that Benjamin must stay as a slave. This is the second stage of repentance. They confess. They do more: they admit collective responsibility. This is important. When the brothers sold Joseph into slavery it was Judah who proposed the crime (37: 26-27), but they were all (except Reuben) complicit in it. Finally, at the climax of the story Judah himself says “So now let me remain as your slave in place of the lad. Let the lad go back with his brothers!” (42: 33). Judah, who sold Joseph as a slave, is now willing to become a slave so that his brother Benjamin can go free. This is what the sages and Maimonides define as complete repentance, namely when circumstances repeat themselves and you have an opportunity to commit the same crime again, but you refrain from doing so because you have changed. Now Joseph can forgive, because his brothers, led by Judah, have gone through all three stages of repentance:  admission of guilt,  confession, and  behavioural change. Forgiveness only exists in a culture in which repentance exists. Repentance presupposes that we are free and morally responsible agents who are capable of change, specifically the change that comes about when we recognise that something we have done is wrong and we are responsible for it and we must never do it again. The possibility of that kind of moral transformation simply did not exist in ancient Greece or any other pagan culture. Greece was a shame-and-honour culture that turned on the twin concepts of character and fate. Judaism was a repentance-and-forgiveness culture whose central concepts are will and choice. The idea of forgiveness was then adopted by Christianity, making the Judeo-Christian ethic the primary vehicle of forgiveness in history. Repentance and forgiveness are not just two ideas among many. They transformed the human situation. For the first time, repentance established the possibility that we are not condemned endlessly to repeat the past. When I repent I show I can change. The future is not predestined. I can make it different from what it might have been. Forgiveness liberates us from the past. Forgiveness breaks the irreversibility of reaction and revenge. It is the undoing of what has been done. Humanity changed the day Joseph forgave his brothers. When we forgive and are worthy of being forgiven, we are no longer prisoners of our past. Segun tomado de, http://www.algemeiner.com/2014/12/25/the-story-of-joseph-and-the-dawn-of-forgiveness/ el jueves, 25 de dic. de 2014.